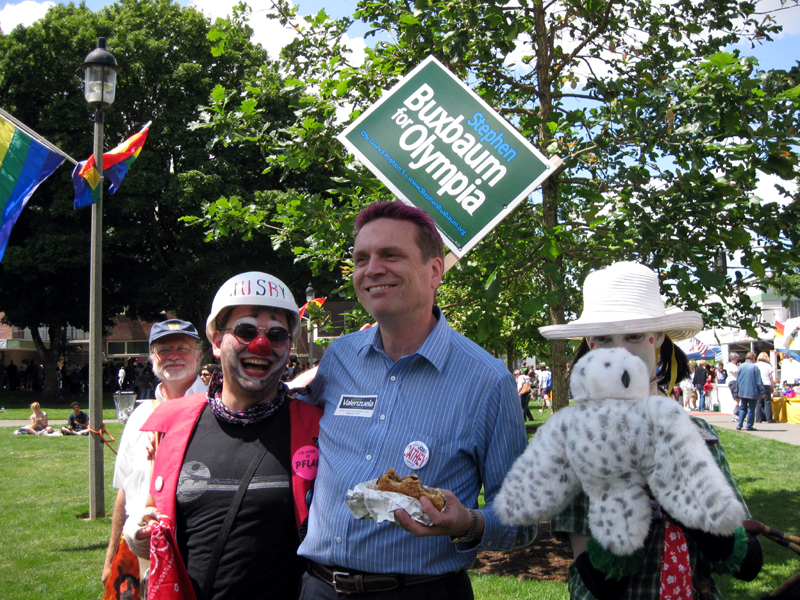 Olympia Time: "What is up with Steve Buxbaum?" EDIT October 10, 2011: I just realized that this blog post I put up is being used in an anonymous lit drop campaign in Olympia. I don't endorse its use and while I find photo-bombing funny and sort of rude, its no reason not to vote for Stephen Buxbaum. If you found this post through a flier left on your door step by someone you don't know, well, consider the source. In a completely innocent context that question was asked of me this morning. In answering I said "seems like a good candidate on paper" (I'm supporting JK btw), but, wow. Your opponent should be allowed a photo-op with a clown without you jumping into the picture with your sign and half smile. Or, is this a case of un-equal time with clowns? The Olympia Clown Guild will take this one up at their next meeting. Steve is just gettin face time. And out of the thousands of photos taken at Pride you pick out two that you think put Steve in a less than positive light I gotta shake my head over the trivialness of your framing of the issue. When a feller is out spent two to one, when a feller lacks the pulpit of the council, when a feller has worked in the non-business community, when a feller runs on principle, when a feller lacks the incestuous polish of our current council, a feller is apt to fail the inside baseball political sophistication we in the biz find so intriguing. 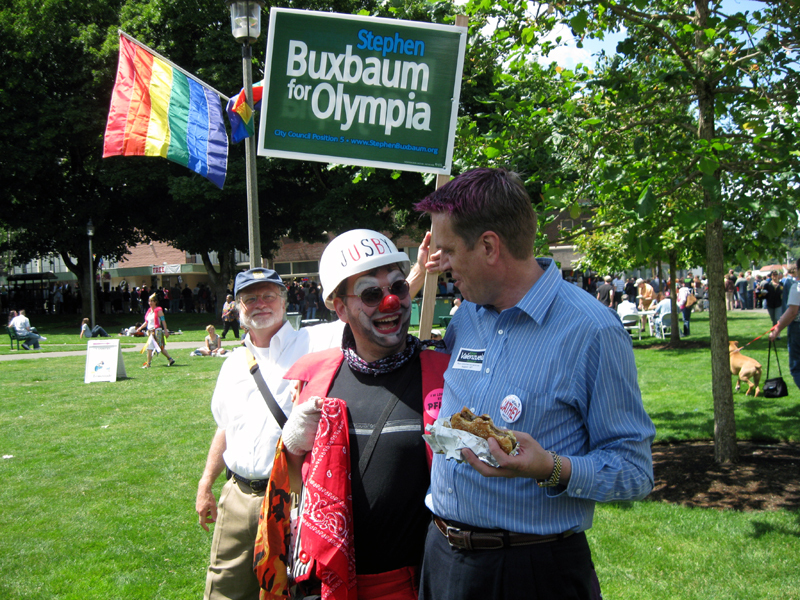 I ask you Emmett and the rest of your readers to get acquainted with Steve's background and his vision for Olympia and forgo the cheap political shots over walking past a current city council person posing with a clown. Laurian, you are awesome! And, I mean that with 100 percent sincerity. I do think people should learn more about Steve if they want to support a candidate like him or Janine (Gates). That said, I don't think I was cherry picking photos, and if that how Steve gets face time, its a goofy way. This is not how you a.) get face time or b.) get taken seriously as a candidate for public office. Buxbaum competely mitigates any qualifications he has for the office by pulling silly pranks like this. I don't want a council member who pulls stunts, I want someone who takes the job seriously. Yes, he has an uphill battle, and he needs to be knocking on every door in town and appearing at every event and showing off that big brain of his that I keep hearing about. So far it seems quiet on the Buxbaum front. That's not how you beat a hometown incumbent with vast resources. His bangs are pink, not red, and it's at PRIDE, so it seems appropriate. I'm not even going to get into your clownist comments, The Clown Mafia will deal with that. Here's a funny, though. Jeff 'untagged' his picture when I posted to fcbk. And I have no horse in the race. If I just went to the more famous guy for the photo op. They were all huddled together, and I recognized Kingsbury. Honey gave a pitch for Buxbaum while she was there. I don't want to speak for Jeff. Oh, yes I do really. So here's the story he told me: Jeff posed for the picture at Jusby's request. He thought it odd that several Buxbaum supporters were watching the pose with delight and giggling. Then another clown jumped in and asked for a second pose while making a snide remark about Kingsbury supporters being everywhere. More chuckling and outright guffawing which further perplexed Jeff because it just didn't seem that funny. The next day he loads up Olyblog and sees Buxbaum leering over his shoulder waiving that sign. Ha ha ha, yuk, yuk, yuk. Classy move. Laurian: "incestuous polish"? Have you been abusing a thesaurus? Nobody is related to anybody on the Council. We do all get along well. Perhaps you are craving some drama? And if Mr. Buxbaum had been caught accidentally in one picture I'd agree with your observation, but that was not the case. He and his supporters set it up and he hung around for two different poses. He was not "walking by". Full disclosure of my biases: I adore Jeff Kingsbury and fully support him for reelection. Also, I have coulrophobia. Always have. I'm not trying to overcome it, either, so don't be offering any clown acceptance therapy. When clowns and I keep our distance from each other we are both better off.